A woman is beaten to death by her maid in front of her child, a family maid kills a 4-year old child, an Ethiopian maid survives apparent 4-story suicide, a maid commits suicide after being accused of theft. The more I hear about tragic stories involving housekeepers and employers in Lebanon, the more convinced I become that I will never hire a housekeeper under this archaic Kafala (sponsorship) system. 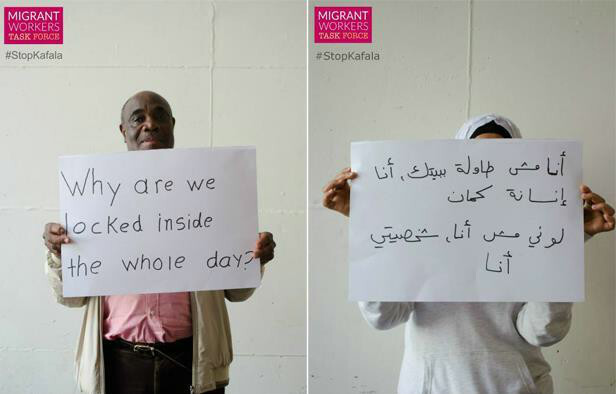 The Kafala system is to blame for all the tragedies that are happening because it is reinforcing the status of migrant domestic workers as victims of human trafficking and forced labor and is building unhealthy relationships between the housekeepers and their employers. The whole process from the beginning is wrong and needs to be changed drastically. Most recruiting agencies treat domestic workers like slaves, confiscate their passports and beat them up if their employer is not satisfied, and then expect them to behave normally and go on with their lives. Think about it this way: If you were asked to leave your home, travel to a foreign country where you are mistreated by a local recruiting agency and get not training whatsoever and then you’re handed to a family where you risk getting abused or locked up all the time inside the house what would you do? Even if some employers are the kindest and most friendly and treat the housekeeper as a family member, they will never be able to understand what’s going through her mind. Personally speaking, I refuse to hire someone I know nothing about to sleep in my house and take care of my family. More importantly, my apartment is not fit to host a housekeeper and I cannot let a human being live in a tiny room that barely fits a bed and get locked up all day. If I can afford one day to buy a big house or a villa and have an isolated and decent shelter for a housekeeper then I will look for a professional agency (if there are any in Lebanon) and hire one. Until then, I will hire a cleaning lady to come once or twice a week just like I’m doing now or learn to manage just like our parents and grandparents used to do. As much as your nice and treat your employee well. The fact that she has to sleep in the kitchen or in a tiny space is mistreating her. And i hate it when people say “ana ktir mniha ma3a” like its something to be proud of, as if it is something special. Eno leh 3am tehke fiya!! akid baddik tkoune mniha! Chou helo eza mannik! Hopeless case just like other issues in this country. It’s a sad truth but it’s part of Lebanese “mode de vie” and show off ….so Love it or Leave it ! The agency that brought her should actually be responsible for her well being, and must act as a union that would protect her rights as an employee.